Legality is a traditional normative concept to regulate the relationship between those in power and those subjected to that power. The principle of legality protects the citizen against the arbitrary use of power, or, more precisely, it demands a legal basis (which itself must be of a certain standard) to legitimize State action. Is legality under siege in Europe? The authors contributing to this provocative and important book answer this question in the affirmative. 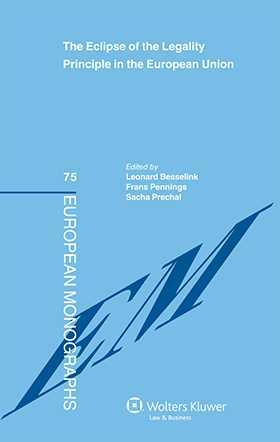 Twenty-one outstanding European legal scholars expose a spectrum of ways in which the traditional legality principle is under pressure because of the creation of new legal orders, including that of the EU, and the interaction between these new orders and that of the State, combined with such factors as expertise driven governance, difficulties of international organizations to meet their objectives due to a lack of adequate powers, and lack of parliamentary control. the prominent role of the EU in the field of data protection. There can be little doubt that the issue of legality and to whom it applies – in a world in which the role of the modern State is changing profoundly – is a crucial one. It is highly important in the context of the ongoing discussion on the meaning of democracy and citizenship. This volume, with its clear message that reconsidering legality demands taking serious issue with the uncertainty engendered by the processes of globalization, will resonate profoundly among practitioners and policymakers in this time of momentous change. Preface. List of Authors. List of Abbreviations. Part I: Introduction: Transformation. 1. Introduction: Legality in Multiple Legal Orders; L. Besselink, F. Pennings, S. Prechal. 2. As Good as It Gets: On Risk, Legality and the Precautionary Principle; B. de Vries, L. Francot-Timmermans. Part II: Legality and the Attribution of Powers to Public Authorities. 3. Administrative Powers in German and English Law; G. Jurgens, M. Verhoeven, P. Willemsen. 4. National Legality and European Obligations; M. Verhoeven, R. Widdershoven. 5. The Legality of Independent Regulatory Authorities; A. Ottow, S. Lavrijssen. Part III: Legality and Quality of Legislation. 6. The Quality of the Law as a Tool for Judicial Control; A. Woltjer. 7. Coherent Codification? A Case-Study in EU Equal Treatment Legislation; S. Burri. 8. The Rocky Path of EU Legislation on Workers’ Involvement: Coherent Codification of the Right to Information and Consultation of Workers in European Law? T. Jaspers, R. Meyers. Part IV: Legality and the Impact of Non-Legislative Instruments. 9. The Open Method of Coordination in the Area of Social Policy and the Legality Principle; F. Pennings. 10. The Principle of Legality and the ‘Soft Law’ Regulation and Supervision of Financial Markets; T. Duijkersloot. 11. The Quasi-Legislative Powers of the European Social Dialogue: Imperfect Delegation of Powers or Ambivalent Recognition of Contractual Autonomy? A. Veldman. Part V: Legality and Concealed Mechanisms behind Extension of EU Powers. 12. The Principle of Attributed Powers and the ‘Scope’ of EU Law; S. Prechal, H. van Eijken, S. de Vries. 13. Eurojust II: Un tiens vaut mieux que deux tu l’auras? T. Marguery. 14. Legality and Data Protection Law: The Forgotten Purpose of Purpose Limitation; E. Brouwer. 15. Conclusion: The Eclipse of Legality – An Assessment; L. Besselink.